De Quintet – Alles draait om de eenvoud. The Quintet is an exciting device which can accommodate up to five switches. The Quintet has been made specifically with teachers, therapists, mentors and parents in mind who want to use music in their activities with children or grown-ups. It’s been specifically used for every-day use in the field. It’s a musical device which stands alone, is robust, and it contains many pre-programmed songs. It has a built-in speaker and operates with a battery. Just switch it on and you’re ready to play. No valuable therapy time is lost, and it’s easy to take it along to other therapy rooms. The Quintet comes with a book full of fun activities. The Quintet is well-suited for working with a group. All participants can play their own role within a piece of music. But it’s also a therapeutic aid. One application allows a therapist to introduce a child to the concept of using switches. It’s also a valuable aid in Forced Hand Use training. Usually, the decision to use a switch is based on the motor abilities of the participant, although this may not always be the case. Making music using switches is easy and convenient. Therefore, it’s a highly appropriate way for children to get started with music. As a group activity in class, or as an aid in occupational, speech, music or physical therapy. 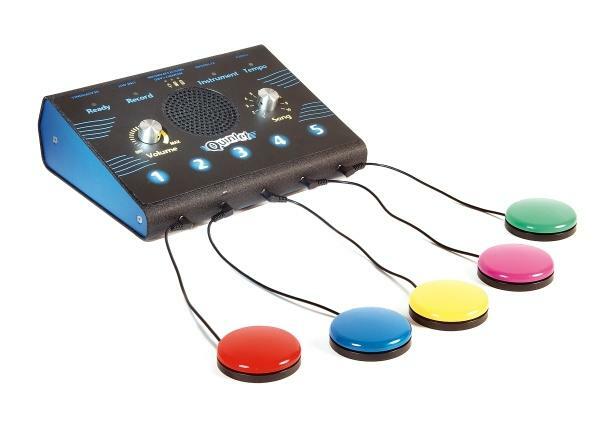 Making music with switches is also suitable for children with low cognition and for very young children.